Teen tennis sensation Sania Mirza rallied from a set down to reach the singles semifinals of the WTA Hyderabad Open here today. Continuing her dream run before the home crowd, Sania fought back from a first set deficit to beat Tziport Obziler of Israel 4-6, 6-3, 7-6 (7/5) in a pulsating quarterfinal duel. In a breach of security, more than a dozen armed youths, claiming to be Shiv Sena activists, managed to enter the Punjab Cricket Association (PCA) stadium here this evening. Policemen stand outside the pavilion block of the PCA Stadium at Mohali on Thursday after some miscreants tried to enter the stadium. As Pakistan and India cricket boards continue to talk over the issue of playing in Ahmedabad, there are indications that Pakistan was considering a BCCI proposal of playing at least a one-day game at the venue, which the PCB has described as unsafe for the series. Skipper Graeme Smith scored his second hundred in three matches and Justin Kemp hammered a spectacular 80 off 50 balls as South Africa beat England by seven runs in an enthralling fifth one-dayer. Tendulkar is my favourite overseas player. For patriotic reasons, Brian Lara is the best Caribbean represents for me. They are different people and none the less because of the different culture they come from. Lara, because he is a left-hander is flashy and elegant. India ‘A’ beat India Seniors by six wickets to win the NKP Salve Challenger one-day cricket tournament here today. After the early loss of three wickets, a captain’s knock of 72 not out by Rahul Dravid steered India ‘A’ to the target of 212 runs with eight balls to spare. Pakistan is all set to play a three -day cricket match against the President's XI at Dharamshala from February 25 to 27. The first-ever international match is expected to give a major boost to tourism and the game of cricket in the state. Himachal Pradesh Cricket Association's (HPCA) spokesperson Mr. Vishal Marwah told The Tribune that it was for the first time that an international match was being organised in the state." Top seed Jeevan Neduchezhian of India justified his seeding when he secured a berth in the final. He will clash with third seed Xiao-Peng Lai of Hong Kong in the ITF Junior Tennis Tournament at the CLTA Stadium, Sector 10, here today. In the girls singles section, fourth seed Amina Rakhim of Kazakhstan will take on unseeded Martina Lautenschlager of Switzerland in the final tie to be held tomorrow morning. Amina Rakhim of Kazakhstan in action during her semifinal match against Andrei Laura Loana of Romania the SAIL ITF Junior Grade 3 Tennis Tournament in Chandigarh on Thursday. DAV College, Jalandhar, fought back from a 0-2 deficit to pip Faculty of Social Sciences, Jamia Millia Islamia (Delhi), 6-5 via the tie-breaker and retain the title in the 12th ONGC-Nehru Champion Colleges Hockey Tournament at the Shivaji Stadium here today. Silvia Farina Elia of Italy returns a backhand to Virginie Razzano of France during their match in the Paris Open Gaz de France tennis tournament at the Coubertin stadium on Wednesday. Farnia Elia defeated Razzano 6-4 6-1. Narain Karthikeyan made his Formula One track debut with the first testing session for Jordan Toyota in Silverstone in Northamptonshire. It was a perfect test run for Narain and his teammate Tiego Monteiro of Portugal as the brand new Jordan Toyota EJ15 roared over 400 kilometres, well more than a full Grand Prix distance of 300 km, to prove its reliability. Senior Vice-President of the Indian Hockey Federation (IHF) and eminent academician, Prof Gursewak Singh (82), passed away at a Mohali hospital late yesterday evening where he had recently undergone a heart bye pass surgery. National Junior and Sub-Junior Skiing Championship-2005 being organised by Directorate of Mountaineering and Allied Sports, Manali, with the assistance of Himachal Pradesh Winter Games Association under the aegis of Winter Games Federation of India started at famous Solang Ski slopes, 13 km from here, yesterday. The home-and-away Test series between India and Pakistan junior hockey teams, slated for April, seems grounded before it took off, with both parties citing a hectic schedule that leaves no space for the series. P. Harikrishna emereged as joint winner in the International Invitational Chess Tournament after clinching his last round match against Grandmaster Bartlomiej Macieja of Poland here. The 18-year-old Sania, fresh from a historic run at the Australian Open, would now take on Maria Kirilenko of Russia, who stunned top seed Na Li of China 6-4, 6-3. The other semifinal would be contested between Anna-Lena Groenefeld of Germany and Alyona Bondarenko of Ukraine. Groenefeld beat Tian Tian Sun of China 7-6 (7/5), 6-3 while Bondarenko beat Marie-eve Pelletier of Canada 7-6 (7/5), 6-4. It was Obziler, the world number 115, who started on a confident note in the match, breaking Sania to go 4-3 up in the seventh game. But it was a different ball game in the second set, as Sania rallied brilliantly to gain the upper hand. She then raced to a 5-2 lead in no time before wrapping it up 6-3. Sania raised her game several notches to take an early 3-0 lead in the decider and looked like running away with the match. But Obziler had different ideas. She hung on and patiently worked her way up. She broke Sania in the fourth game and again in the sixth to level the scores. Realising that it was a do-or-die battle for her, Sania played her heart out to reach the brink of victory, only to let slip the advantage. She was leading 5-3 before allowing her opponent to come back into the match and what followed was a tense tie-breaker, which had the crowd at the edge of their seats. It was 5-5 in the tie-breaker, but it was Sania who held her nerve to emerge victorious. Martina Navratilova’s progress in the doubles event came to a sudden halt after her partner Anna-Lena Groenefeld pulled out of their second round match after aggravating a thigh injury. In a breach of security, more than a dozen armed youths, claiming to be Shiv Sena activists, managed to enter the Punjab Cricket Association (PCA) stadium here this evening. The youths entered the stadium with an aim to dig up the pitch and sabotage the organisation of the Indo-Pakistan Test match scheduled to be held in the first week of March. While six of these persons were apprehended by the stadium’s security guards, the rest managed to flee. According to the local police, all the men, armed with iron rods and raising slogans against the cricket tour, jumped over one of the outer locked gates of the stadium and ran across towards the ground through an inner gate, which was open. Before they could get on the ground, they were caught by the security guards, said the police. Sources, however, revealed that at least 30 activists of the Shiv Sena (Bal Thackeray) and the Shiv Sena (Hindustan) were staging a dharna outside the stadium, protesting against the organisation of the match for over half an hour before some of them jumped over the gate and entered the stadium. No action was reportedly taken by the stadium security guards till they went inside. Mr I.S. Bindra, president of the PCA, who rushed to the stadium from Patiala, said no damage had been done by the miscreants. However, police sources pointed out that these men were able to break some of the grills. Dismissing the activists as miscreants hunting for publicity, Mr Bindra said this incident would not have any effect on the India-Pakistan match. Adding that the Mohali stadium was the safest stadium in the country, Mr Bindra said security cover in the stadium had been increased and the DGP, Punjab, had arranged for special police parties to be on round-the-clock duty along with the stadium’s own security. “Normally, three weeks before the scheduled dates, state security is in. But following this incident, we are doing it from today,” he said. The SP, Mohali, Mr Rakesh Agarwal, said the six persons arrested were being interrogated. “All of them are from Haryana. One of them claims to be the president of the Shiv Sena’s unit in Narwana. We will conduct raids through the night to arrest the rest of their group,” he said. He added that the police was first informed by a newspaper agency that the Shiv Sena was planning to dig up the pitch in the stadium. “These youths have no regret and are admitting that they faxed the newspaper agency before attacking the stadium. We received a call from the newspaper agency at about 4.45 pm and within minutes received a call from the stadium that some persons who had entered the stadium have been caught,” he said. The President of the Board of Control for Cricket in India (BCCI), Mr Ranbir Singh, said the attempt by some miscreants to dig up the pitch at the PCA Stadium at Mohali was “unfortunate”. The stadium is scheduled to host the first Test between India and Pakistan next month. 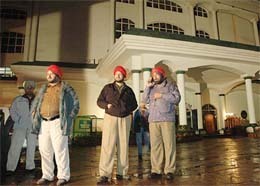 Mr Ranbir Singh, speaking on the telephone from Bhiwani, said that all associations who were likely to be allotted matches in the forthcoming tour of the Pakistan team to India should take adequate steps to beef up security at their respective stadiums so that such incidents do not occur again. The BCCI President said he had no knowledge of the extent of the damage caused to the PCA Stadium pitch since the Punjab Cricket Association had yet to get in touch with the board. Condemning the attempt to sabotage the pitch at the PCA stadium in Mohali, Punjab Chief Minister Capt Amarinder Singh today directed Director-General of Police S.S. Virk to beef up security in the area. Mr Virk was also asked to step up patrolling. A case of rioting was registered against the accused. Though there was no official word on the meeting, the local media suggested during after the meeting of the BCCI vice-president Rajiv Shukla and PCB chairman Shaharyar Khan here, India has proposed a one-day game at Ahmedabad and shifting of the Test venue to Chennai, which Pakistan might consider. The BCCI vice-president was in Lahore on a private visit but called on PCB chairman Shaharyar Khan. Though the PCB officials say that they were ''heartened and encouraged'' by the BCCI secretary S K Nair's statement who suggested to shift the proposed Test from Ahmedabad, there is no official yes or no on the subject. ''The time is running out and we have to deal with the situation and make a decision at the earliest. However, we are encouraged by the response of BCCI secretary S K Nair that India may consider shifting away the game from Ahmedabad,'' said PCB General Manager Cricket Operations Zakir Khan. Earlier, Pakistan had declined to play a Test in Ahmedabad citing security reasons and requested the BCCI to schedule the game at any other Test venue. Saying that Pakistan's decision was based on political grounds, various Indian politicians took up the issue, suggesting that Ahmedabad was a safe place to tour. However, the PCB has denied that their decision was politically influenced. KARACHI: Despite the delay in finalising the itinerary for the India-Pakistan series, set to kick off in barely 15 days, the Pakistan Cricket Board does not see any “real hurdle” in allocation of tickets or other logistics. Zakir Khan, PCB’s General Manager (Cricket Operations), who was part of the two-member security assessment team that visited India, said PCB did not forsee any problem either for its team or the huge number of spectators planning to cross the border for the clash between the Asian giants. “There is tremendous enthusiasm in India and the people are ready to welcome Pakistan spectators with open arms. I just had the opportunity of discussing the allocation of tickets and logistics in Mohali and cricket officials have assured that they would block 5,000 to 10,000 tickets for Pak spectators,” Zakir Khan told PTI from Lahore today. “I was also told that there would be standard rates for inter-city ground travelling while some of them even offered to make hotel reservations if asked,” said the former Test fast bowler. Skipper Graeme Smith scored his second hundred in three matches and Justin Kemp hammered a spectacular 80 off 50 balls as South Africa beat England by seven runs in an enthralling fifth one-dayer. That gave the home side three wins in a row and a 3-1 lead with only two matches remaining. Smith, who made his maiden one-day hundred in the third match of the series yesterday, batted through the 50 overs to end on 115 not out and put on a lightning 117 with Kemp as the home side amassed 311 for seven after opting to bat. England clung on despite a slow start, with Michael Vaughan making 70 and South African-born Kevin Pietersen a fine knock of 100 not out off 69 balls but they fell just short, closing on 304 for eight. 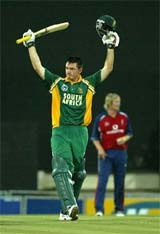 Pietersen had the consolation of pulling a six off the last ball from Andre Nel to reach three figures. The right-handed Kemp, though, left the winner, delighting the crowd with seven massive sixes and four fours, his best score in one-dayers. South Africa’s total was the highest one-day international score ever made at East London, while England recorded their best total against South Africa although the boundary ropes had been brought in after heavy rain affected the outfield. Fall of wickets: 1-10, 2-100, 3-119, 4-181, 5-298, 6-298, 7-300. Bowling: Gough 10-0-52-3, Hoggard 9-0-74-0, Ali 9-0-66-2, Collingwood 10-0-53-0, Trescothick 3-0-17-0, Giles 9-0-46-0. Fall of wickets: 1-22, 2-61, 3-117, 4-179, 5-224, 6-236, 7-254, 8-290. Tendulkar is my favourite overseas player. For patriotic reasons, Brian Lara is the best Caribbean represents for me. They are different people and none the less because of the different culture they come from. Lara, because he is a left-hander is flashy and elegant. There is a certain panache about his batting, his bat comes down on the ball with a high backlift. Tendulkar stands still at the crease but loves to attack and is very positive. He could have scored more runs but then he is no Geoff Boycott. As a person, Tendulkar has invited less controversy than Brian. On a different note, I can't help commenting that when it comes to style, I find Rahul Dravid most stylish. In boxing parlance, he gets his punches without anyone noticing it. At the end of it, his opponent is bruised! I didn't change my style but then Tendulkar is finding his own challenge in a different way. It doesn't make him any less passionate. He has wonderful love for the game. I lasted up to 38 and could have gone on and tried to accomplish a few more things. Under Dennis Waight the fitness levels we had could have matched any of today's top teams. When I left, my mind was willing but wear and tear and ageing had begun to show up at the door. Thank God, I never really was seriously injured. 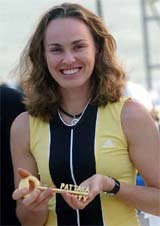 I kept working hard, trying to be superfit, a healthy athlete. I wore my heart on the sleeve and showed more emotion on the field. Tendulkar never contests a decision. But then everyone is different. His affair with the game has lasted long. It can continue for at least four more years. He must have set himself targets which he could achieve. I have always called him Kid. I first heard of him through Ian Bishop. Touring Indians in England in late 80s were playing against Derbyshire in a first class fixture and he smacked Bishop back over his head for a six. Now Bishop was definitely one of the meanest. He tried to be aggressive to the young man and the little man dispatched him. I remember Bishop telling me with a certain urgency in his voice: The little guy is dangerous. Now Bishop wasn't the one to praise a batsman easily. I said who he was talking about. Why did he say so. His talk had the feeling about somebody who would become an icon in years to come. Tendulkar, as we know, has turned out to be of some rare value. I have met him a few times, with his wife and kid around in England, shared a flight with him and his family. We have discussed cricket at times. I remember my chat with him in Antigua. Indians were touring the West Indies in 2002 and he was struggling for runs. I went to the dressing room and he was very accommodating. I said to him: Sometimes negative thoughts could occupy the mind. There are times when because of the attacking style of ours we could do something silly, hit in the air, make a wrong judgment. We hear a lot of boo-boos from critics. But that is our style. We could have hiccups, bad times. But when on song, it is a sheer pleasure for people. It removes boo-boos. More often than not he would succeed. He just needed to be resilient. Resilient he sure has been. In Sydney he made 241 after a poor decision he received in a previous Test. But he didn't let it get to him. It was typical of him. If you could score against Australia, against any opposition on any surface, you are alright. This kid has been brought up on pressure. Ever since he was young, he shouldered responsibility. When he was captain, I always thought a big burden had been placed on somebody so young. Something we all ignore is the commercial pressure he works under. It's a huge factor, an obstacle. There is an impossible demand on your time and attention from sponsors. There must be so much running on the young man's mind. Tendulkar, through his passion, has shown that cricket remains his priority. I've always looked at him as somebody who loves the game. That's why he is successful. He is level-headed and his interviews show it. He is well-respected, and let's speak in this way, an icon. One of the coolest characters the game has seen. If he was to walk off the field today, without ever lifting a bat again, he would still be one of the icons, a true legend. India ‘A’ beat India Seniors by six wickets to win the NKP Salve Challenger one-day cricket tournament here today. After the early loss of three wickets, a captain’s knock of 72 not out by Rahul Dravid steered India ‘A’ to the target of 212 runs with eight balls to spare. He shared a century stand with Jadhav before combining with Kaif to take India ‘A’ to a six-wicket win. Earlier, left-handers Sourav Ganguly and Niraj Patel batted fluently to notch individual half centuries, but India Seniors never recovered fully from a poor start and were shot out for 211. Ganguly won the opening battle in his skirmish with India ‘A’ captain Rahul Dravid by winning the toss, but thereafter, was forced to see wickets tumble at the other end as India Seniors were bowled out in the 48th over. Young Uttar Pradesh left-arm medium-pacer Rudra Pratap Singh broke the back of the India Seniors innings with a three-wicket burst, including two in his first over, during his long spell of 8 overs. Fall of wickets: 1-10, 2-11, 3-48, 4-54, 5-93, 6-113, 7-163, 8-177, 9-211. Bowling: Zaheer 10-1-45-1, Singh 9-1-42-3, Paul 9-1-41-2, Karthik 10-1-39-0, Pathan 4-0-19-0, Mongia 5.2-0-21-2. Fall of wickets: 1-1, 2-14, 3-38, 4-139. Pakistan is all set to play a three -day cricket match against the President's XI at Dharamshala from February 25 to 27. The first-ever international match is expected to give a major boost to tourism and the game of cricket in the state. Himachal Pradesh Cricket Association's (HPCA) spokesperson Mr. Vishal Marwah told The Tribune that it was for the first time that an international match was being organised in the state." "The match will not only boost tourism, but also encourage cricket in the state, " stated Mr. Surinder Thakur, President, District Shimla Cricket Association. "If we succeed in making it a success, the Board of Control for Cricket in India (BCCI) will allot us one-day international in the state in the near future", hoped the HPCA's members, saying that during their stay, cricketers could also visit Kulu, Manali, Shimla and other hill stations during the series. The hoteliers and tourist operators are upbeat over the match, saying that the match will boost tourism not only in the Kangra valley, but it will give a big exposure to several tourist destinations in the state. "We expect that cricket stars from both countries will experience warm hospitality of the people in the hills at hill stations like MacLeodganj, Kulu-Manali, Shimla and Dalhousie", the hoteliers said. "The willing players can fly to Bhuntar and Shimla", hoped Mr. Ajay Rana, secretary, Mandi District Cricket Association. Pakistan will play three Test matches, one three-day match and five one-day international matches in the country. The HPCA members said that all hotels had been booked in the Dharamshala. "We seek cooperation of the state government in making the match a success. "Once we do that we can bargain for a bigger pie in the near future as cricket stadium is one of the best in the country", they claimed. The members said that the BCCI was assisting the HPCA in conducting the match. Top seed Jeevan Neduchezhian of India justified his seeding when he secured a berth in the final. He will clash with third seed Xiao-Peng Lai of Hong Kong in the ITF Junior Tennis Tournament at the CLTA Stadium, Sector 10, here today. In the girls singles section, fourth seed Amina Rakhim of Kazakhstan will take on unseeded Martina Lautenschlager of Switzerland in the final tie to be held tomorrow morning. Earlier, Tamil Nadu’s Jeevan Neduchezhian, ranked 43rd, showed his class when he demolished sixth seed Vaja Uzakov of Uzbekistan. The match lasted 85 minutes and the scores were 6-3, 7-6 (4). Third seed Xiao-Peng Lai of Hong Kong overcame an injured and second seed Vivek Shokeen of India in straight sets 6-2, 6-3. Vivek ranked 46th and winner of the Delhi ITF, could not do much due to his shoulder injury. In the girls semi-final, Rakhim faced a stiff resistance from giant-killer Andrei Laura Loana of Romania before winning 7-5, 6-2. Yesterday Andrei had shocked top seed Sandhya Nagaraj of India 7-5, 6-3. In the second semi-final, unseeded Martina Lautenschlager ended the challenge of eighth seed Yanina Wickmayer of Belgium 7-5, 6-4. Today’s results: all semi-finals: girls singles: Amina Rakhim (Kaz) b Andrei Laura Loana (Romania) 7-5, 6-2, Martina Lautenschilager (Sui) b Yanina Wickmayer (Bel) 7-5, 6-4. Boys singles: Jeevan Neduchezhian (Ind) b Vaja Uzakov (Uzb) 6-3, 7-6 (4), Lai Xiao-Peng (Hong Kong) b Vivek Shokeen (Ind) 6-2, 6-3. Boys doubles: Jeevan Nedunchezhiyan and Vivek Shokeen (Ind) b Kinshuk Sharma and Tariq Jacob (Ind) 6-0, 6-3, Vaja Uzakov (Uzb) and Stas Zoravsky (Russia) b Sumit Parkash Gupta and Kaushik Raju (Ind) 4-6, 6-1, 6-3. Girls singles (quarter-finals): Andrei Laura Loana (Romania) b Else Potgieter (RSA) 6-1, 6-1, Amina Rakhim (Kaz) b Dilyara Saidkhodjaeva 5-7, 6-3, 6-4, Yanina Wickmayer (Bel) b Madura Ranganathan (Ind) 6-0, 6-0, Martina Lautenschilager (Sui) b Mariya Malkhasyan (Ukr) 6-4, 6-3. Girls doubles (Qf): Madura Ranganathan and Sandhya Nagaraj (Ind) b Poojashree Venkatesh and Varsha Shivshankar (Ind) 6-2, 7-5, Dilyara Saidkhodjayeva (Uzb) and Yulia Parasyuk (Rus) b Mariya Malkhasyan and Iryana Khatsko (Ukr) 7-5, 6-3. DAV College, Jalandhar, fought back from a 0-2 deficit to pip Faculty of Social Sciences, Jamia Millia Islamia (Delhi), 6-5 via the tie-breaker and retain the title in the 12th ONGC-Nehru Champion Colleges Hockey Tournament at the Shivaji Stadium here today. DAV College thus made it a hat-trick as they were the champions in 2004 and 2003 as well. They had so far lifted the title seven times to maintain their record of never losing the title match. In an absorbing contest, Jamia Millia scored once in each half to take a 2-0 lead. The first goal materialised in the 15th minute when Bharat shot in from an actue angle, just inside the dee, off a pass from Sahil Bansal to crack the goal drought. And two minutes into the second half, Bharat was once again on the mark when he beat the defence, pulled himself back into the top of the circle, before letting go a rasping shot, which brooked no denial (2-0). Though the Jalandhar boys played a co-ordinated and pleasing game, their moves invariably fizzled out inside the circle. And they also frittered away two penalty corners before Harjit Singh got his act together off the third one to sound the board with a direct hit (1-2) in the sixth minute of the second half. Encouraged by this stroke of luck, DAV College mounted pressure, which fetched them two more penalty corners in quick succession, out of which the fifth one was guided in almost from the goal line by Major Singh after Harjit’s hit popped up off a defender’s stick. With the scores even (2-2), both teams tried to get the match-winner, but in vain, and the fight was then taken to the tie-breaker shootout. The Jalandhar boys triumphed in the shootout with their precise marksmanship while Jamia bungled twice. “It went very well, we did lots of distance and I’m happy with the test so far. We had no major problems, and achieved my aim which was to complete 300 km,” Narain said after the testing at the famous circuit where Formula One was born in 1950. “Last time I drove a single-seater car was in November and the first thing I’ve driven on the circuit since then is a Formula One car! “So it was very quick and very exciting this morning but I now I’m getting used to it and it’s time to get on with the work,” said Narain, the first Indian to race in the elite motorsport event. The body of Prof Singh, who at present was a member of the Punjab State Planning Board, was brought to his Yadvindra Colony residence in the wee hours today. Hundreds of persons from all walks from life attended the cremation. The pyre was lit by his only son Dr Manmohan Singh. Prominent among those who were present the Chief Parliamentary Secretary Rana Gurmeet Singh Sodhi who placed a wreath on behalf of the Punjab Government, Mayor Mr Vishnu Sharma, Commissioner Patiala Division, Mr C.S Srivastava, Deputy Commissioner Mr Tejveer Singh, Vice Chancellor Dr S.S Boparai, DIG Patiala range Mr I.P.S Sahota, SSP Mr A.S Rai, former Cabinet Minister Mr Brahm Mohindera, former Deputy speaker Mr Bir Devinder Singh, former Punjabi University VC Mr Bhagat Singh and Head of the Department of Sports Sciences of NIS Dr Ashok Ahuja who placed a wreath on behalf of the NIS. The Punjab Sports Department was represented by Patiala District Sports Officer Mrs Narinder Cheema, senior football coach Mr S.S Gill and senior cricket coach Mr Talwinder Pal Singh. Condolence messages were received from Mr R.S.Gill on behalf of the Basketball Federation of India, Mr M.P Pandove on behalf of the Punjab Cricket Association, Mr G.S Bains on behalf of the All India Liberals Hockey Tournament organising committee, Mr R.P Pandove on behalf of the Patiala District Cricket Association, senior IPS officer Mr Harpreet Singh Sidhu on behalf of the Punjab Boxing Association, Mr N.P Singh, Press secretary of SAD (Mann) on behalf of former MP Mr Simranjit Singh Mann. Prof Gursewak Singh is survived by his wife Mrs Harbans Kaur and his son Dr Manmohan Singh, who apart from being a leading cardiologist is, at present, the Chairman of both the Punjab Medical Council and the Medical Commission of the Indian Olympic Association . Deputy Director, Mountaineering and Allied Sports, Manali, Cap Randhir Singh Salhuria, disclosed that Indian skiing team to participate in Asian Junior ski championship-2005 in China will be selected during the week. The present itinerary has Pakistan hosting India, South Africa and Japan in a four-nation tournament here from March 7 to 13 and then head for the six-nation tournament in Kuala Lumpur from March 26 to April 3. Besides Pakistan, India, Germany, England, Korea and Malaysia will also be there for the tournament. Harikrishna shared the title in this category-17 double round-robin tournament with Boris Gelfand of Israel as both players ended with 6 points each. Chennai Veerans defeated Bangalore Hi Fliers 5-4 via tie-breaker in a thrilling contest of the Premier Hockey League at the Gachibowli hockey stadium here today.